In this article, let’s check the Wildfly Remote Naming Service. In the previous article, we have checked NamingStore and NamingsService. We understand that the purpose of the NamingService is to enable NamingStore during Wildfly startup process. In addition to this process, Wildfly also need to enable remote naming service, so the users can access the service from other machines via network. From the above diagram, we can see the the RemoteNamingServerService contains the remoteNamingService and namingStore. We have learned the namingStore is the backend repository of the registered naming resources. On the other hand, the remoteNamingService is the class that provides naming service remote access ability. The above code shows the logic of the start(...) method: It will create a namingContext with namingStore included, and then register the namingContentxt into remoteNamingServer. 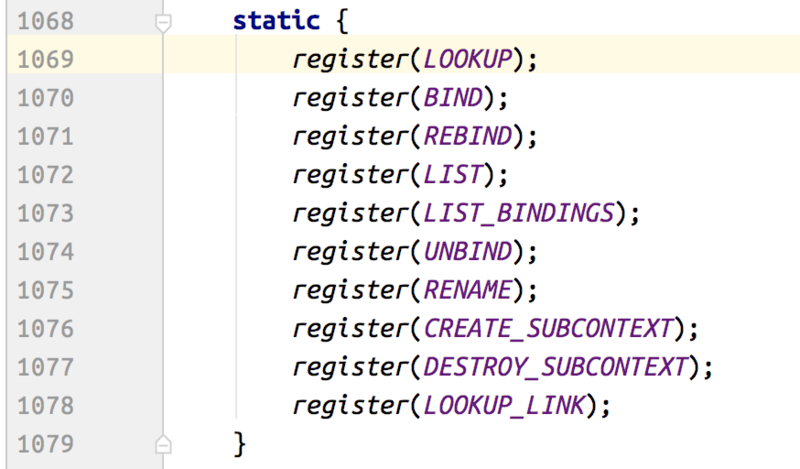 Finally it starts the remoteNamingService by calling its start(...) method. 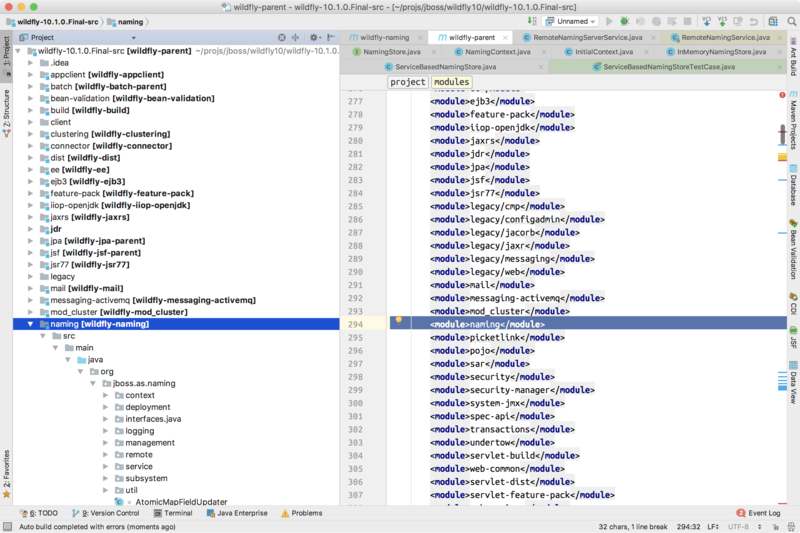 From the above screenshot, you can see the project structure of the jboss-remote-naming project. From the above diagram, we can see the RemoteNamingService and its inner classes. 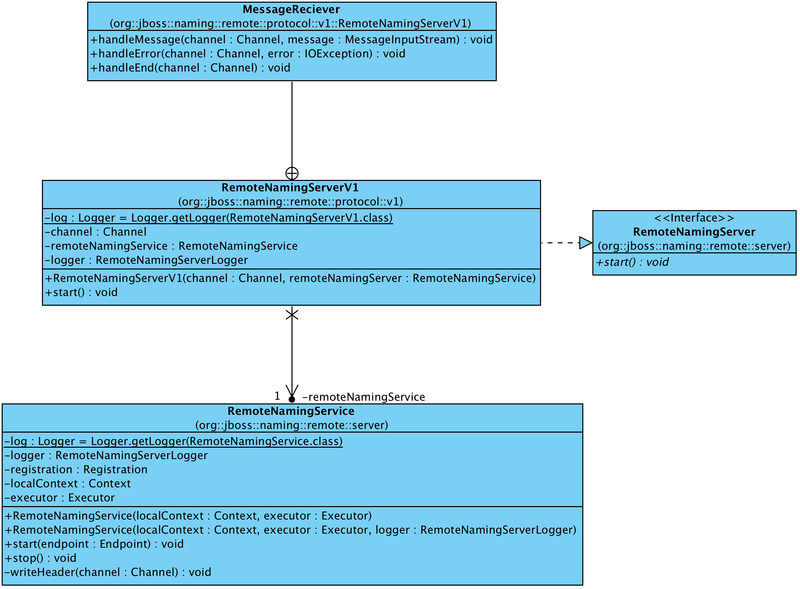 We know the service loading process in Wildfly is asynchronous, so from above diagram, we can see RemoteNamingService will use ChannelOpenListener and ChannelCloseHandler to manage the service lifecycle. 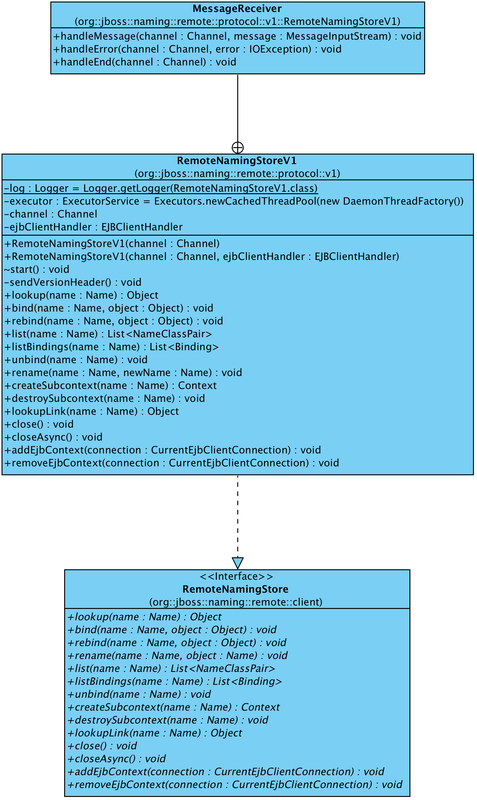 There is an additional ClientVersionReceiver inner class in the diagram, and we will check its usage later. From the above diagram, we can see RemoteNamingServer currently has one version of implementation, which is RemoteNamingServerV1. In addition, we can see the RemoteNamingServerV1 contains MessageReceiver to deal with the incoming request. From the above screenshot, we can see the operations implemented by the class. Because the Protocol class is very big and it contains a thousand lines of code, so I won’t explain its detail implementation here. From the above diagram, we can see the RemoteNamingStore is used to store the naming resources provide the resources via JNDI operations. From the above diagram, we can see the ProtocolCommand defines two methods: one is handleServerMessage(...) and the other is handleClientMessage(...). In handleServerMessage(...) method, it uses the remoteNamingService (There is currently a typo in the class, and I have submitted the PR to fix it. See: fix a minor typo in ProtocolCommand #32) to interact with the naming service provider(The Wildfly server in our case). In handleClientMessage(...) method, it uses the namingStore to deal with the user requests. This is very similar to the situation we have see in the previous article, which Wildfly uses the local NamingStore to deal with the local JNDI requests. I have removed unrelated code and in above you can see how does the LOOKUP operation implements the ProtocolCommand interface, and how the namingStore and namingService are used in the methods. We can see the Protocol class uses the ProtocolCommand to provide services to both server side (Wildfly) and user side. Compared with the local naming service in Wildfly source base as we see in last article, the remote design is more complex. Above are all the topics I want to say in this article. In the next article, let’s see the network communication layer of the jboss-remote-naming project.